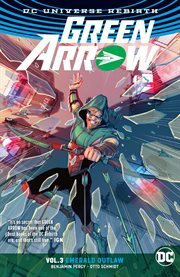 The item Green Arrow, Volume 3, issue 12-17, Emerald outlaw, Benjamin Percy, writer ; Otto Schmidt, Juan Ferreyra, Eleonora Carlini, Carlos Rodriguez, Gus Vazquez, artists ; Otto Schmidt, Juan Ferreyra, Hi-Fi, colorists ; Nate Piekos of Blambot, letterer ; Juan Ferreyra, collection cover artist, (electronic resource) represents a specific, individual, material embodiment of a distinct intellectual or artistic creation found in Kent District Library. Written by Benjamin Percy (TEEN TITANS) and gorgeously illustrated by Otto Schmidt (Korvac Saga) and others, comes a pulse-pounding urban adventure that debuts one of Green Arrow's greatest villains in GREEN ARROW VOL. 3: EMERALD OUTLAW! Oliver Queen has lost it all. His sister, Emiko, is missing. His vast family fortune has been obliterated. And the entire world believes he's dead. That's when his problems really begin. As he fights to reclaim what he's lost, Ollie continues patrolling Seattle's streets as its vigilante guardian. But soon a rash of murders with a deadly accurate archer as the culprit puts the whole city on edge, and Oliver Queen is the prime suspect... To clear his name, Green Arrow must find the real killer as the Seattle police hunt him down with extreme prejudice. With Black Canary at his side, can Ollie find his target? Or will he and his reputation both end up six feet under?